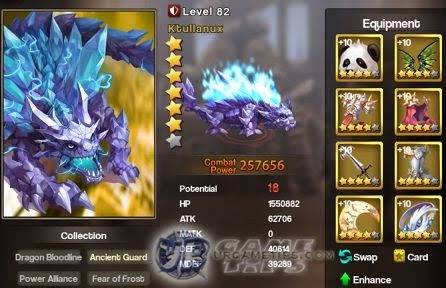 Here's a guide on how to farm materials for crafting Purple, Yellow, Red and Gold equipments, a feature from the RPG mobile game Ragnarok Rush. - Green gears are given by default to all Pets. - Blue gears can be farmed from Gateway stages. Use the "Recommend" option from your Pet's gears section to quickly point you to the specific stage where you can farm them. - Obtained through Crafting (would recommend Weapons since they are uncommon from drops and events, but skip if you want to craft yellow weapons instead, especially for VIP players). - During the tutorial, the game will let you craft any purple gear you want. Do not select any, and keep the materials instead to craft a purple Headgear or Weapon later on, or you can craft a Rosary for your tank. - Some Purple Armors can be obtained from Event Rewards (check all upcoming daily rewards). - Random reward from the Prontera Defense event (lower Lvl bosses). Purple weapons can drop from Eclipse. - Join a Guild and apply for the Purple gears that are available. Highly recommended because it's free, but please make some Donations to the guild to give something back too. - Buy Equipment Chests: Would highly recommend using x10 Summons to get a random purple gear (except Hat, Wings, and Weapons). This is the fastest way to get Purple gears as long that you have extra Diamonds. - Commonly found from events and story rewards. - Carniums can be farmed from the Ruins (recommended, and best during 2x drop events). - Random rewards from the Prontera Defense event (Carniums at lower bosses only though). You can also get some Red Scale Shards by drawing rewards after a fight. Draw using Diamonds to get more (recommended from Dark Dales and above bosses). - Join a Guild and apply for these items for free (only 1 per day though for members). - Buy Equipment Chests: Would highly recommend using x10 Summons to get 100% chance of getting 20 Carniums and 10 Red Scale Shards. - Buy from Equipment Chest Exchange Shop using Arm Points (accumulated every time you use summons). Use your points if want to save energy instead of farming a lot of them, but your choice still because you can also use the points for purchasing those limited event Oridecon Hammers. - Some Yellow Armors can be obtained from Event Rewards (check all upcoming daily rewards). - Obtained from rare and Limited Events that gives you boxes with random Yellow equipments. - Random reward from the Prontera Defense event (would recommend from Nattegge onwards, spend Diamonds to increase chance). - Buy from Prontera Defense Shop. 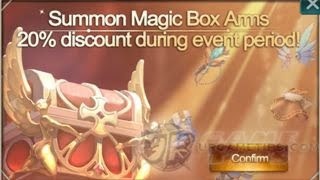 - Buy Equipment Chests: x10 Summons will net you 100% chance of getting 1 Hammer. This is the fastest way to get them as long that you have extra Diamonds. - Join a guild and apply for it. This might take long depending on the number of players that are waiting in-line for that item to drop. - Random reward from Faction War chests (chest with crafting materials). - From Rare and Limited Events. - Collect materials from events (usually by charging diamonds), and other sources like shops (Eden Group Mission Prestige Shop), then craft better gears once you have the items needed. - You can buy Red Weapons from the Equipment Chest Exchange Shop using Arm Points (accumulated every time you use summons). 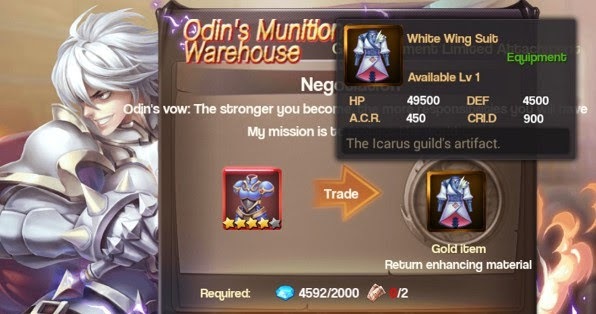 - Hint: You'll need 45,000 Diamonds with 20% Discount to reach 750 Arm Points...so, it might be best to just wait for the limited event where you can buy Oridecon Hammers instead. - Random reward from the Prontera Defense event (from Evil Octopus onwards, spend Diamonds to increase chance = drop rate: rare!). - Random reward from the Faction War chests (chest withcrafting materials = drop rate: rare!). - Buy from Eden Group Mission Prestige Shop (recommended). - Join a strong guild and apply for it, if available (unlocked at higher Gateways? Needs confirmation or wait for future updates). - Sometimes it will appear from the Equipment Chest Exchange Shop (using Arm Points) as a limited time event. Requires 100+ Arm Points. - From Rare and Limited Events (recommended for VIP players). - Random reward from the Prontera Defense event (Demon Hunter, higher lvls). - Buy from Eden Group Mission Prestige Shop. Once you are able to open Lvl 21+ Gateways, complete them then reset to re-farm Honor and Elite Honor points. - Required item that can be exchanged for Gold equipment during special events. Requires a Red Gear and Diamonds. - Drops from Demon Hunter (Prontera Defense). - Obtained by charging diamonds or from VIP rewards. - You need to craft their Golden Weapons first, after that, collect all necessary materials to craft their Legendary Weapon. This upgrade will give extra stats and boost the Ultimate skill of your character (get asap for VIP players) or Pet (Potential 18+ pets only). - Check the "Unique" tab from their equipment screen to open the Legendary weapons crafting option. Which Gears to Craft First? - Only craft Gears that can quickly enhance your Character and Pet's performance. Here's some examples, but always prioritize your main character first then your core team. - Purple Gears are easy to obtain so complete them as you go, but focus more on getting Yellow gears, especially weapons. Red and Gold equipments might take some time, but keep farming their crafting materials. - Follow the below examples according to your job class, but still try to complete all gears to get huge bonuses from Set Effects. Check below for more info about Set Effects. - Armors > Hat and Wings > Weapon (can be skipped, but needed for set effects). - Weapon > Hat and Wings > Armors (can be skipped until you get more resources). - Melee DPS units can still become vulnerable from AoE attacks, so upgrade their armors if needed. - For Thief Class, also consider getting some nice armors for them. - Ranged units can become vulnerable from AoE and Backstab attacks, so upgrade their armors if needed, especially units placed at the back. - Armors above also includes Necklaces and Rings. Recommended that you get 1 Armor and 1 Ring/Necklace first. - Hats are called Accessories in the game which is confusing, that's why I used Hats instead. - Gears that you no longer need can be used by your backup Pets for other game modes. - First of all, a lot of newbies are ignoring this which is really bad even if they have powerful pets, because some players are still using green weapons to their tanks combined with purple and yellow armors at Lvl 60+ for example. - Click on the "Set Properties" button near your character or pet's avatar. - Character equipments can activate Set Effects (stat bonuses) when certain conditions are met. - Note: Higher grade equipment can substitute lower grade equipment. Example: If you have 7 Purple gears and 1 Yellow gear, then together they would still activate the effect = Equip 8 Purple equipment items. - Units with Physical Attacks = ATK, A.CRI and AP. May also include CRI.D and HIT. - Units with Magic Attacks including Healing = MATK, M.CRI and MP (except for full support Healers). May also include CRI.D and HIT. - For Melee and Tank units = HP, DEF, MDEF and FLEE. May also include A.C.R, M.C.R and HIT. 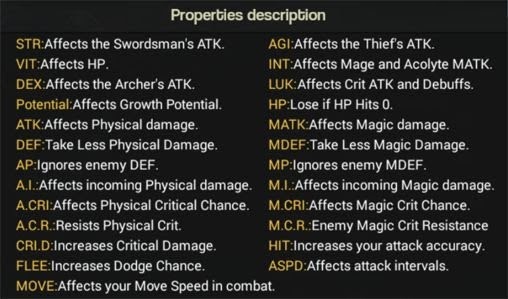 Note: You may add any stat you think is suitable for your main character or pets like HP, DEF, MDEF and FLEE to increase survivability of your DPS pets for example. Thief class can go with a Glass Cannon all attack build, or Attack+Survivability hybrid. - Enhance your gears to +10 to unlock it's next Refine Lvl. - Only requires a number Gold, but increases as you go higher. - Enhancing gears won't trigger any set effects. - Refine your Gears to increase their stats bonuses and to unlock set effects! - Check Set Properties section in-game, near your avatar to learn more. - Can be farmed from Gateway Ruins, advance the game to unlock higher grades of Refining Scrolls. - Can be farmed too from Gateway stages and Ruins. Best if you do this while farming shards, materials for promotions, quest items and more (recommended because it only uses 6 Energy per run and 100% drop rate). - Can be obtained as rewards from various events and game modes (ex: Faction War crafting chests, might need are strong ally to occupy Field or World Mines). 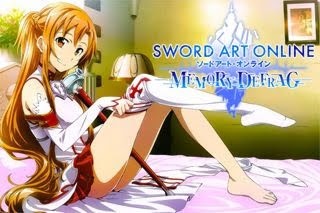 - Can be obtained from the Mysterious Summons using Gold, or from the Equipment Chests using Diamonds. - Other Drop Locations: Endless Tower, MVP Challenge, Garden Palace dropped by Pets, and more. - If you want to prioritize their strengths, and increase the number of Stars or Enhancement higher than other gears, then that's ok too. Follow the example methods below as a guide. - Armors > Hat and Wings > Weapon (but still recommended for set effects too). 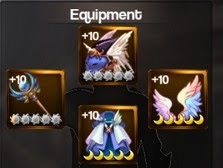 - Weapon > Hat and Wings > Armors (increase once you get more resources). - For Thief Class also consider refining your Armors too. - Weapon > Hat and Wings > Armors (increase once you get more resources, especially for units placed at the back to increase survivability from AoE and backstab attacks). - You may enhance and refine Blues early game to 1~2 Stars. Dismantle them using Gold once you no longer need them at higher levels. - Purple gears can also go until 2.5~3 Stars, or even up to 5 Stars as long that you know what you are doing (usually used as fillers, to get the set bonuses). - This method would also mean that you are willing to dismantle them if no longer needed (using Diamonds) once you get better ones. - This is where your main focus should be, and slowly upgrade their Stars to max as you go. - Since they are harder to get, you can combine them with Purple Gears for now, but always learn how to prioritize. - TIP: Once you reach 3~4 Stars to all of your gears, enhancing fees will probably cost Millions of Gold from here on, so you might want to stop here for now, especially when you have limited resources around mid game. - For late game content, max them out too whenever you get the chance. What Will Happen If All Stars are Maxed? - Moon Icons will appear instead of Stars for more enhancing and refining options. - If you can max out all Moon Icons, Sun Icons will appear next. - For gears that you no longer need, go to the Crafting section > Sell > Dismantle. - By default, dismantling gears and weapons will bring back 80% of all upgrading fees and materials used. - WARNING! Dismantling gears will destroy the gear, and will only save the materials and Gold used.